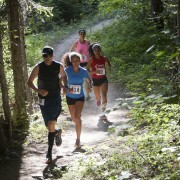 Runners in the 2012 Red Devil Challenge move through the forest. CASHMERE — A year ago, a devilish character appeared along the trail. This year, who knows. 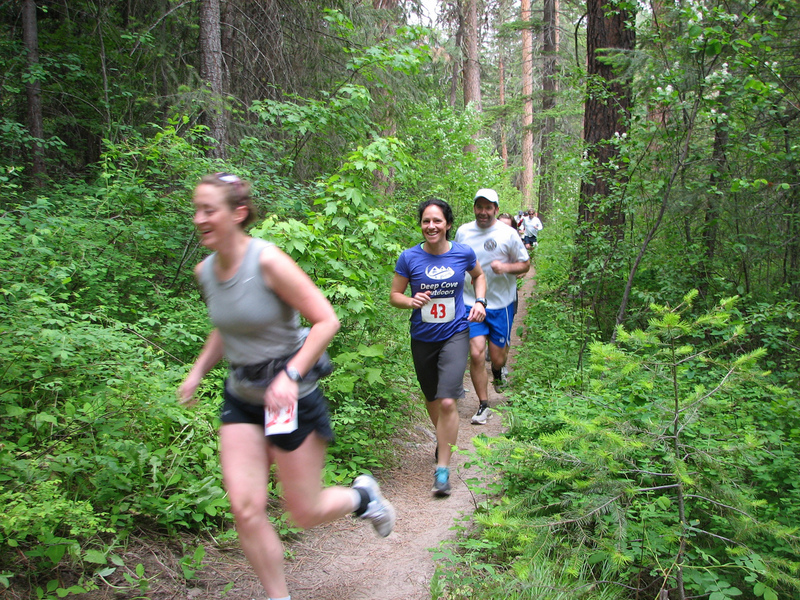 Organizers of the Red Devil Challenge say there will be plenty of surprises as the third-annual event unfolds Saturday in the Wenatchee National Forest south of Cashmere. “Anything is possible,” said Joel Rhyner, race director. The event is sold out, a development Rhyner attributes to adding 10-kilometer and 1.7-mile runs to the traditional 25k trek. “That has opened up the door to many people who otherwise wouldn’t attempt a trail run or wouldn’t feel capable of finishing a 25K,” Rhyner said. One of the surprises — if you can call it that — is a late redesign of the 10K course. Upper Mission Creek Road, which accesses the spot where the 10K was to have started, has been closed by the U.S. Forest Service as a precautionary move against danger posed by flash floods. Last fall’s wildfires left some hills in the area barren of vegetation increasing the chance of rising waters if heavy rain were to hit the area. Rhyner said the new 10K course will start and end at Sandcreek Trailhead, where the other two runs will be held as well. He expects the 10K course to be warmly received by trail runners because it includes a nice climb, a fast descent and the crossing of two streams. The 25K course remains the same, meaning runners will follow a loop that includes about 3,000 feet in elevation gain in all. For extra incentive, CrosSport Performance of Wenatchee is giving away prizes to the first man and first woman to reach the high point in the 25K course. Awards to the top finishers will be given out in a ceremony at the finishing area at the Sandcreek Trailhead. A post-race party will be held at Milepost 111 Brewing Co. in Cashmere. Milepost 111 also is the pick-up and drop-off spot for bus shuttles being used to transport runners. The 25K run begins at 8:45 a.m., followed by the 10K and 1.7-mile runs at 9 a.m. 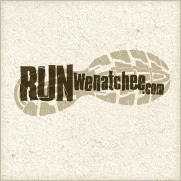 Results will be published on RunWenatchee.com after the race.